So, this blog post will be written by Max, becoming dadsy? 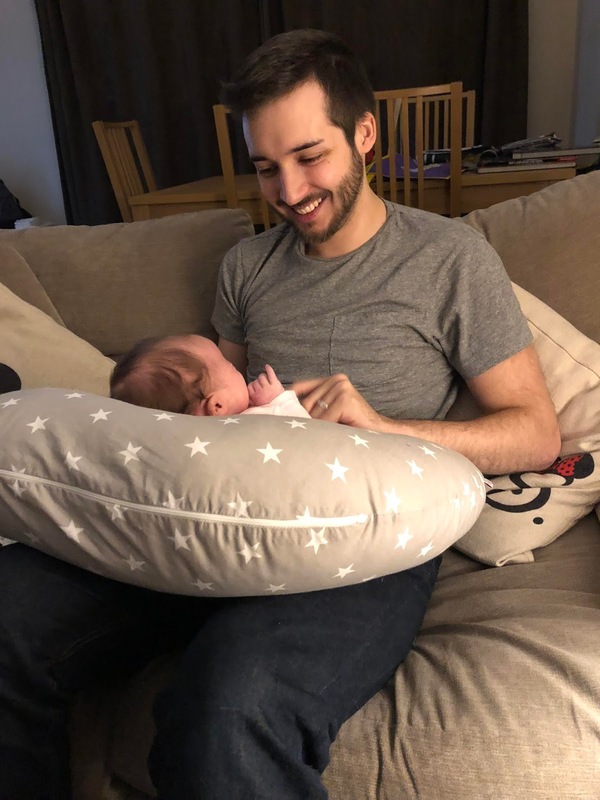 It doesn't quite have the same ring to it, but anyway, this post will be from Dad's point of view, following on from my 6 month update. So, over to him! Edith is sixth months, or as people with babies explicitly explain as 26 weeks old. She’s grown from a tiny baby, who I was scared to get dressed and would happily sleep in my arms, to a little girl who happily plays with her toys, hates letting me put her tops on her and who smiles when I come back from work. I'm not sure I really remember her being so small. I have these glazed over memories of clothes being too little for her, a bumpy journey back from the hospital and watching her and mum sleeping together exhausted on the sofa. I’m not sure anyone can prepare you for becoming a parent and, more specifically, a dad. It's a job that you take on without fully realising the responsibilities you’ll be taking. You know it will involve looking after a baby, probably changing nappies and getting the pushchair in and out of the car, but I’m not sure that I really appreciated that deciding to have kids is like taking a second job, but somehow coming out with less money than you started. You are tired (but never as tired as mum, ever.) You have no time (Going to work and looking after the baby are two different things and you should take over whenever you can. Mum is exhausted and she wants to feel like a human too! Not just a milking machine ). Luckily Amy breastfed, and still does an amazing job of feeding our daughter, but unfortunately Edith didn’t like a bottle and we weren’t keen on it either. After you get a latch, the last thing you want to do is potentially interfere with that. Edith was feeding well and was happy. This did mean that I felt a little useless, especially during the night feeds. What is the partner supposed to do in the night? Stay up with mum? Get some sleep? If she wasn’t feeding I did my fair share of walking about the house until she fell asleep, but if she was feeding I just lay there, not knowing what to do. If there is one thing a new dad shouldn’t do, is interfere and try and ‘help’ mum get a latch. Lesson learnt. Poo, pee and sick. Somehow, it becomes a way of life when its your own child. Countless times a day I have sick on my top or trousers. I change anywhere from 5-10 nappies a day but, when she was little, this could be closer to 25 nappies. There might be less nappies, but the volume of poo and wee increases exponentially. You won’t always get it right. 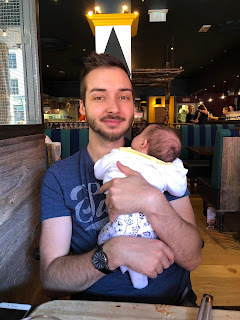 I’d like to imagine myself as some kind of super dad and although I try, it's a learning experience for mum, dad and baby. I have put outfits on the wrong way, nappies back to front and put her in the car seat wrong (don’t worry, mum was on hand to do it properly), but despite all this I've been trying to help, and most of the time succeeded. Being a dad is about giving mum a break despite having to look after a baby and you. Making sure all the little jobs are done so she doesn’t have to do them and giving mum time for a shower because the baby has been crying for 8 hours straight and she's covered in vomit. Best of all, you get to see your baby grow and develop, and as cliché as it sounds, its the most rewarding part. Coming home to a gummy smile and cuddle makes any day worth it. I had my first experience of dad chat at work the other day. As a non-parent, you always seem to see parents congregate and discuss every aspect of this new world, share wisdom and horror stories. But as a dad, it's interesting to see how other people handle parenthood, with warnings of what's to come and seeing how proud they are when talking about their children. The defining stand out moment for me, thus far, has been Edith's first laugh with me. Mum got her laugh pretty early on, maybe at two/three months? But it took a while to find out what I could do to make her really get laughing. My normal repertoire of funny voices and flying children around the room doesn’t really work/is appropriate for a tiny baby. But one evening we were sitting down and I was playing with Edith, making a funny voice, and she cracked up and it was magical. I welled up at the fact that it was me for a change. She laughed at what I was doing and it finally gave me the reassurance that I was doing something right. Remember dads, especially if you're back to work, you are going to be playing catch up with mum for a long time, but it will all happen and it will make it all the more special when its for you. Edith showing me things and how to do them. Her trying to include me in her playtime, and becoming more self sufficient. I just want to enjoy her growing up, even if that means that she's less reliant on me. I want to see what she enjoys doing and what kind of person shes going to be. I can't wait until she can start telling me about her day and be excited about every little thing. I can’t wait to take her on her first trips to different places, and to see her face light up as we watch the fireworks at Disneyland. That about wraps up my first six months of being a dad! Did you enjoy reading about a dad's point of view? Leave me a comment and let me know! I love this. You guys are so bloody cute!! It's so nice to see an honest account of what having a baby is like for a new dad. You are damn right it's about giving mum a break! We need showers and clean clothes too! Love this!!! Max should feature more often! A great first piece Max. Well done!! It was very open and honest and nice to hear from a dad’s point of view!